The twin concepts of Yin and Yang are peculiar to ancient Chinese cosmology. Yin and Yang are symbolized by the sun and the moon. They are the two opposing forces active in the universe. Yin is said to exist in Yang and Yang exists in Yin. This changing combination of negative and positive, dark and light, cold and hot which keeps the world spinning creates Qi or the life giving force of the universe. Earth, moon, dark, femine, negative, absorbing, receptive, winter, soft, cold, still broken & even. Heaven, sun, bright, fiery, moving, odd, powerful, masculine, active, summer. The female principle of yin is associated with the earth, with the North and cold. Originally, Yin means `shady side' which is the side of a mountain which is not facing the sun. The word is also used to mean the dark, cold room in which ice was stored in summer. 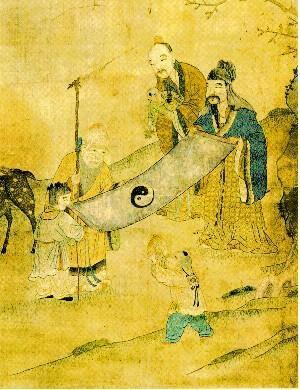 Yang is related to Heaven, South, the Emperor, the dragon and all uneven numbers are yang-numbers.